I am fascinated with the history behind some recipes. The origin of the German Chocolate Cake is not at all what I expected it to be, not even close! 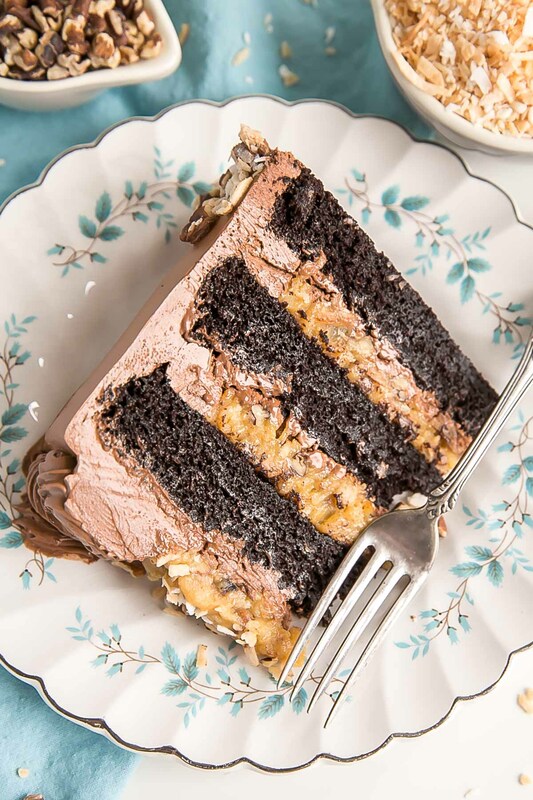 German Chocolate Cake was actually named after American baker Samuel German, who worked for the Baker’s Chocolate company in the mid 1800’s. While there, he created a baking chocolate for the company, which they named Baker’s German’s Sweet Chocolate. 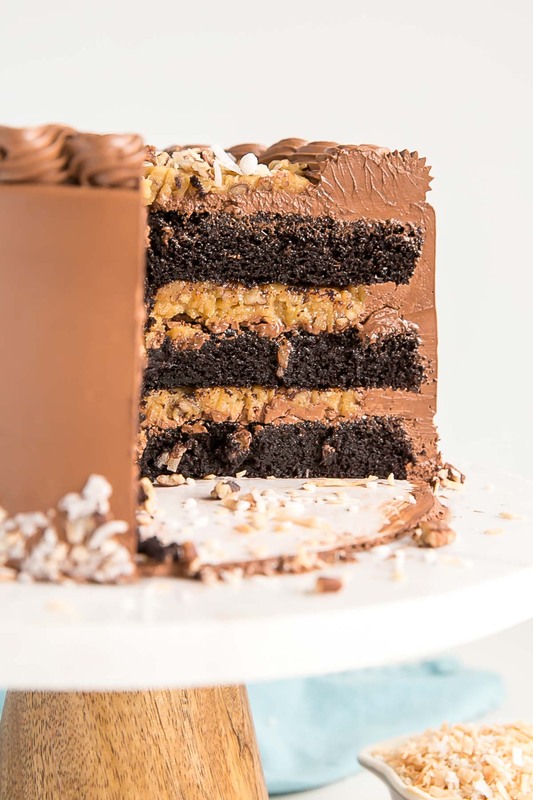 Years later, in the 1950’s, Mrs. George Clay used said chocolate to create a cake that she called “German’s Chocolate Cake“. At some point the ‘s was dropped, and people started calling it what you and I know it as today: German Chocolate Cake. You can read more about the cake’s rise in popularity here. Coincidentally, Baker’s Chocolate Company is not named so because of baking, but because the company founder’s last name was Baker. 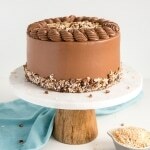 German Chocolate Cake consists of a coconut pecan filling sandwiched between chocolate cake layers. Pretty simple, right? 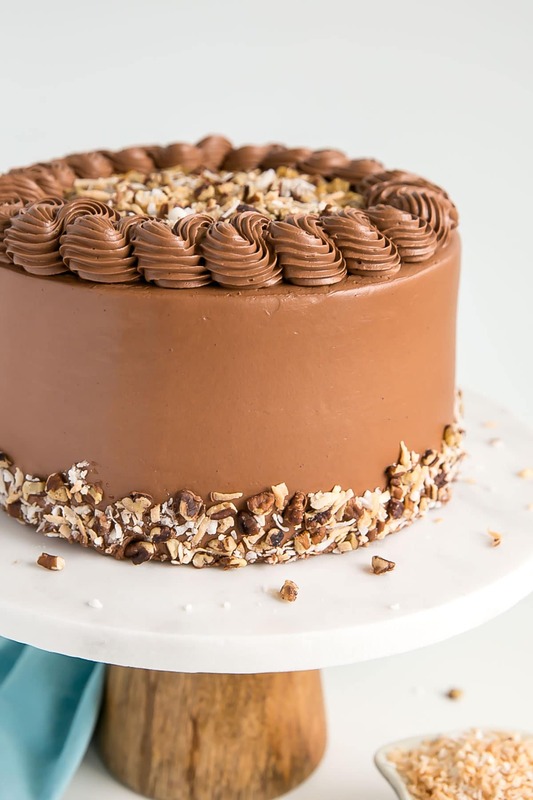 Now, traditional German Chocolate Cake is made using a lighter colored mild chocolate cake. I am a rich/dark chocolate kinda gal, so I’m using my favourite Chocolate Cake recipe as the base for this. The original recipe also does not call for chocolate frosting, but I’m also a cake needs frosting kinda gal, so this is my version of the traditional cake. 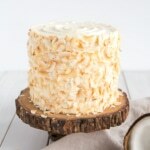 Feel free to skip the frosting if you prefer (there is enough coconut pecan filling fully to top 3 layers). The chocolate cake recipe is pretty standard, it’s one I use all the time in various forms. The only thing to note here is that the batter is very thin and rises a LOT, so don’t overfill your pans — half full max. Since I baked it in three 8″ pans instead of my usual two, the layers are a bit thinner and can be a bit delicate when warm. I recommend chilling the cake layers before assembling the cake. I always wrap the cooled cake layers in plastic wrap and freeze them until I’m ready to decorate. I take them out when I start making the frosting, and by the time the frosting is done, the layers are thawed enough to assemble. The coconut pecan filling is very simple to make. I mostly followed this recipe, with a few minor tweaks: I toasted the coconut and pecans, and used half brown sugar. Note that doing both of these things will make the filling have a yellow tint to it, which is different from the original, but equally delicious. Using brown sugar in the filling makes it a bit trickier to know when it’s done cooking, as you can’t really tell that it has caramelized, so just cook it until it thickens to a pudding-like consistency. Toasting the coconut and pecans is optional, but I find that doing this enhances the flavour. It takes very little time, so I opt to do it when I can. I used sweetened coconut in the filling, but you might want to use unsweetened depending on your sugar tolerance. The filing is sweet. 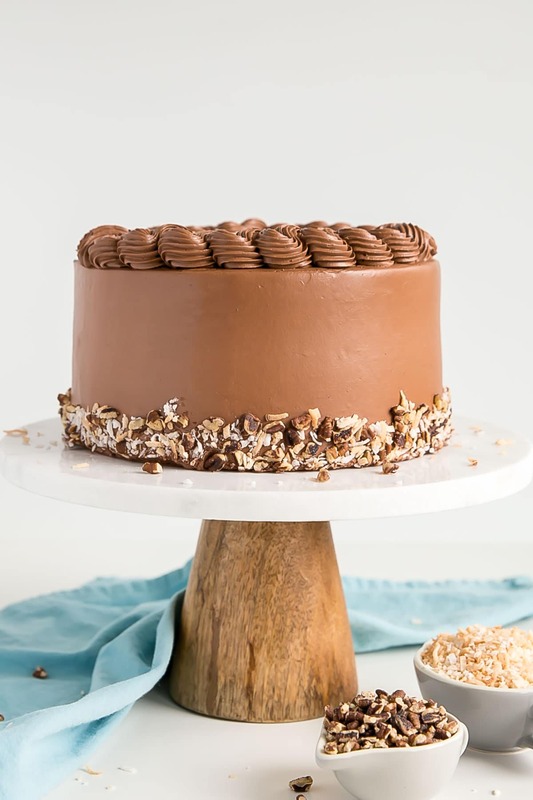 I happen to like it that way (I was eating it with a spoon), and it goes well with the not-too-sweet chocolate cake and dark chocolate frosting, but you may want to tone it down a bit if you prefer your desserts less on the sweeter side. Let’s talk about my cake layers for a sec, because they look more dense than they actually are. This cake was sitting in my fridge for two days while I waited for the weather to clear so I could take pics, so the weight of it compressed the layers a bit. The cake was also cold when I cut it, which makes it look more dense than it is. Not that there’s anything wrong with a dense cake (I actually prefer those), but this one looks almost like a brownie and it is NOT that dense. I am on a quest to find the perfect chocolate Swiss meringue buttercream. We’re getting there. My goal is a dark(er) chocolate frosting (which is hard to do with SMBC) that is stable to frost and pipe with. 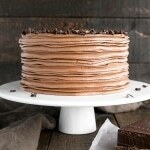 My first chocolate SMBC was for this Mocha Cake. It’s still one of my faves because it’s crazy delicious, but it’s too light in color for what I’m looking for. I’m basically trying to achieve a chocolate American buttercream color with an SMBC. No small feat! My next chocolate SMBC was for this Classic Chocolate Cake. I added more melted chocolate to it, hoping to darken the color. That worked (though not to the extent I was hoping), but the extra chocolate made the frosting quite soft and a bit harder to work with. For the Chocolate Swiss Meringue Buttercream on this German Chocolate Cake, I first started with a dark brown sugar SMBC. At least the base wasn’t pure white, I figured. I also cut back a bit on the proportion of melted chocolate, and added some Dutch-processed cocoa powder to it. It’s better in terms of the color I was going for, but not quite there. I should have added some black cocoa powder, but I was worried that it would skip the dark brown color I was going for and go right to blackish (it’s pretty potent). I will try that next time. Let me tell you though, this chocolate SMBC is the BEST. The flavour is seriously amazing. I don’t know if it’s the dark brown sugar in it, or the combo of the high quality dark chocolate and cocoa powder or what, but I was happily eating this with a spoon. 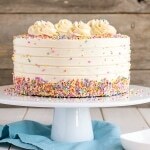 When assembling this cake, I first spread a thin layer of buttercream on each layer before topping with the filling. This is completely optional. 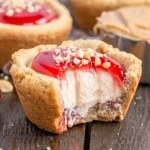 I usually do this with any softer fillings (curd, jam, etc.) so they don’t seep into the cake layer, but this filling is so thick it stands well on its own. You probably don’t need the buttercream dam either. 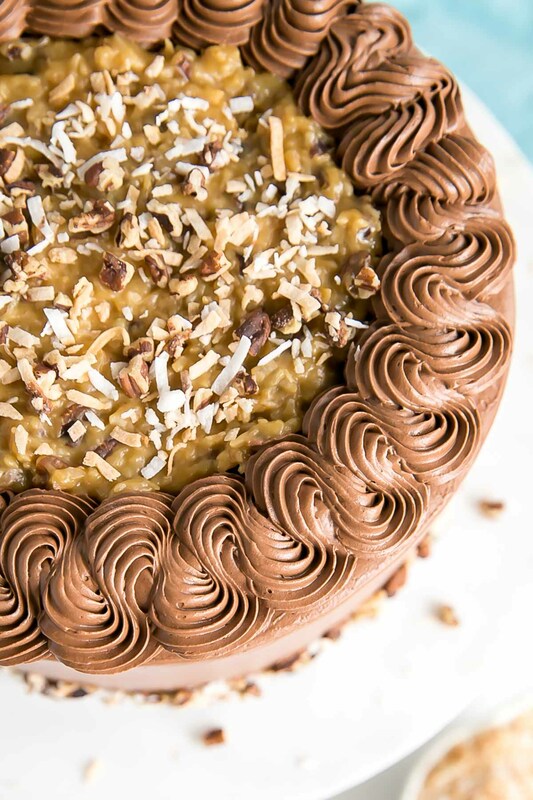 The top border on this German Chocolate Cake is done using a 6B piping tip. I basically just piped the infinity symbol (∞) sideways along the top. 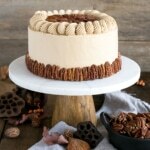 I recommend chilling the cake before filling in the top with the rest of the coconut pecan filling. That way you won’t damage any of the decorative border. 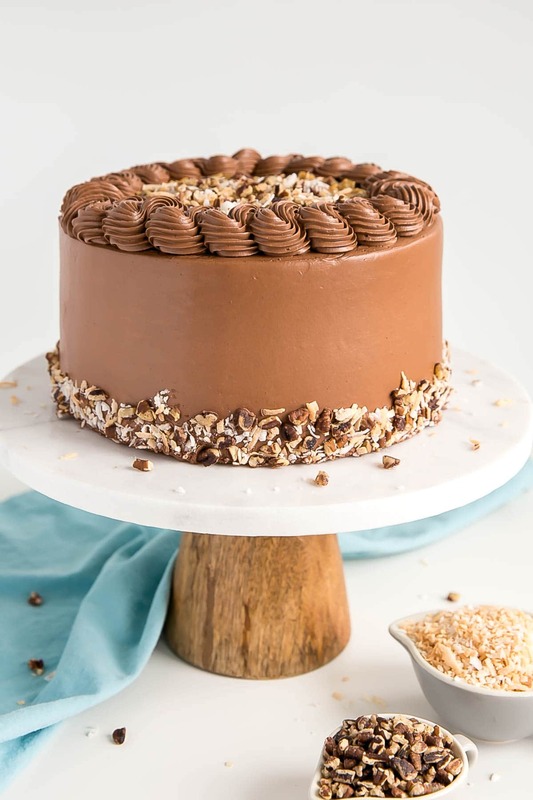 This German Chocolate Cake is the perfect combination of flavours and textures — it’s no wonder it’s been such a hit all these years. I don’t think Mrs. Clay has gotten enough credit for it! And though my cake is modified from her original recipe, I tried to stay somewhat true to the filling. After all, I think that’s what makes this cake what it is! Check out these other German Chocolate Desserts! The recipe as-is will work in either two 8″ or three 6″ pans. The layers will be thicker than in the recipe above (three 8″ pans) though, so you’ll need to increase the baking time. To make cupcakes, all you need to do is reduce the baking time — start checking at 15mins or so. The batter is very thin and rises a lot, so don’t fill the liners more than half full. You can make the pecan coconut filling a couple days in advance, just keep it in an airtight container in the fridge. Bring to room temperature and give it a good stir before using. I used sweetened coconut (half shredded, half flaked), but you can use unsweetened if you prefer a less sweet filling (it was pretty sweet). You can use regular cocoa powder for the cake and frosting if you don’t have Dutch-processed. It will affect the flavour and color slightly. 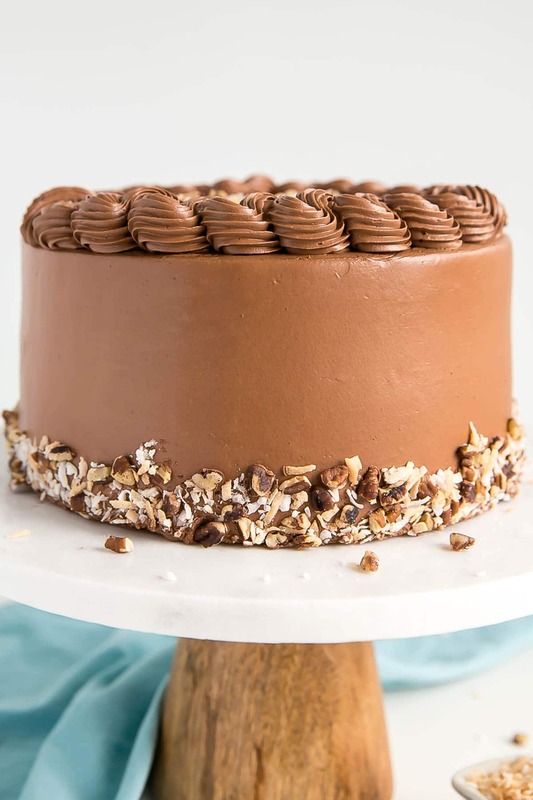 Traditional German Chocolate Cake does not have a buttercream. You can leave this out if you like, and there will be enough of the pecan coconut filling to top 3 layers. Using good quality chocolate for the frosting will make a huge difference! Whisk egg yolks and evaporated milk in a medium saucepan. Stir in sugars, salt, and vanilla. Cook over medium heat, stirring frequently until mixture comes to a low boil. Continue cooking, stirring constantly, until mixture thickens to a pudding-like consistency (about 10mins). Remove from heat. Add butter, coconut, and pecans and stir until combined. Cool completely before using on cake. Preheat oven to 350F, grease three 8" round baking pans and dust with cocoa powder. Line bottoms with parchment. Bake for 30-35 mins or until a cake tester comes out mostly clean. Place bowl over a pot with about 1" of simmering water. Whisk constantly until the mixture is hot and no longer grainy to the touch (about 3mins). Or registers 160F on a candy thermometer. Place bowl on your stand mixer and whip on med-high until the meringue is stiff and cooled (the bowl is no longer warm to the touch (5-10mins)). Add cooled melted chocolate, cocoa powder, and vanilla. Whip until smooth. Place a layer of cake on a cake board or plate. Spread a thin layer of buttercream on top of the layer (optional) and pipe a border around the outside to hold the filling in. Fill with about 3/4 cup of coconut pecan filling. Repeat with next layer. 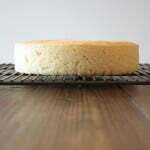 Place final layer on top and do a thin crumb coat on the cake. Chill for 20mins. Frost the top and sides of the cake with remaining frosting. Do a decorative border on top using a 6B tip if desired. Chill for 30mins. Fill top center with remaining coconut pecan filling and spread evenly. Sprinkle with toasted coconut and chopped pecans. Press toasted coconut and pecans along the bottom if desired. Lovely cake…one can never go wrong with a chocolate cake. 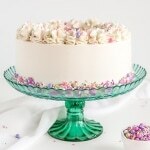 I also love the way you tell the stories..
I’m a first-time visitor to your blog, via a link on Facebook through the Cake Slice Bakers post. Awesome cake, looks delicious and beautiful! I’m going to try it on my family and see what they think. I’m seriously considering adding a bit of orange zest to the filling because it seems complimentary to the coconut, pecan, and chocolate combo. What do you think about that’s? I’m all biased toward oranges these days because my sister and I just got through making batches and batches of orange marmalade from her orange trees in Texas. Sooo flavorful! Hi Olivia, your cake looks good. I wonder ,Is it possible to replace evaporated milk with some other milk. Hi Erica! You can try it with heavy cream instead. I love all of your recipes! I made this cake recently for my sister’s restaurant and sold all 16 slices in one day! It is definitely a keeper as every recipe of yours is that I have tried so far! I’m working my way through each of them. Also thank you for the easy directions on the SMBC! It is now my favorite frosting and it almost always comes out perfect each time! Look forward to a new cake recipe! It looks awesome Kristy! Thanks for sharing 🙂 So glad you like the buttercream — it’s my fave! The cake looks absolutely delicious. My choice birthday cake for as long as I can remember. My daughter-in-law now makes it for me and her father. Can’t wait to try this version. On a side note, where do you purchase your cake platters? This cake looks amazing, my favorite flavor! I am looking forward to baking this in the future! I also adore the plate that the slice of cake is on, please tell me more about that too! Thanks Nancy!! I actually got the plate at a thrift store. I wish I had a better story behind it! I just stumbled upon you via Pinterest and then went on to your site,signed up for the newsletter and even really checked out the school you graduated from…..in my own backyard nonetheless! I LOVE your style of writing and each cake looks to me the perfect blend of perfect professional yet not overdone as so many are these days. I will be baking one of them tomorrow…. P.s are you in the industry now or is this blog a wonderful hobby? Hi Susan! Welcome to the blog! So nice to have you here 🙂 And I know what you mean by the overdone cakes — I feel the same way. Less is more! Except when it comes to flavour of course. Gorgeous as usual! Since you just posted this, obviously I haven’t attempted this cake yet but if and when I do (on a cheesecake experimenting adventure currently), I’ll be back to rate. I just wanted to say how much I enjoy your website. Your writing style, incredibly helpful instructions, your honesty and of course your beautiful and delicious creations. Thank you for sharing you experiments.